BUFORD, Ga. – Kicker Fish pro Cody Bird of Granbury, Texas, took the lead with 16.46 pounds on Lake Lanier after the first day of the season-opening PAA Tournament Series presented by Carrot Stix. 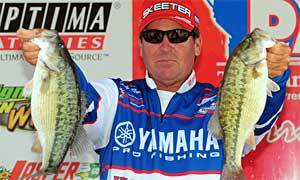 Bird used several baits in shallow and near-shallow water for his five-bass limit. He wasn’t the only one in the field who had to grind all day for every bite. Spotted bass are feasting on the ample forage and instead of eating all the time, they’re often just killing bait. Lures that come by get the same quick chomp or head slap in what becomes a frustrating strike for the angler. Behind him in second place is Yamaha pro Takahiro Omori of Texas (15.68 pounds), followed by TheGreatOutdoors.com pro David Hendrick of North Carolina (15.18). Megabass pro Aaron Martens of Leeds is fourth (14.82) and BransonTourism.com pro Doc Seger of Missouri is fifth (14.62). Final day launch/weigh-in: Saturday, launch at 7 a.m. at Sunset Cove and weigh-in at 4:30 p.m. at Bass Pro Shops, 5900 Sugarloaf Parkway, Lawrenceville, Ga.